Usually we can rely on Paul Smith for cleverness, but he's as subtle as a sledgehammer here. We get it; this is a travel pouch. We probably could have figured that out without the map, compass, and ticket stub illustrations pushing the point. I might not mind the graphics as much if they didn't look like a collection of items from my grandfather's attic. I'm not used to such stuffiness from Paul Smith. It's also disappointing that Paul Smith relies on the print, and doesn't provide what we look for in a travel pouch. It's really basic, without any compartments to organize our passports, boarding passes, or traveler's checks. That might make it versatile if it weren't for that horrible travel print. 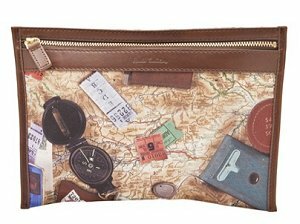 You're hardly going to use such a travel-themed pouch as a cosmetics purse, are you? The price only adds insult to injury. For $125 it's far too expensive for such a simple, lackluster purse, no matter which designer name is attached. The Treesje Fatal bag, a great alternative to this printed pouch bag.